Welcome to PRESTON ARMS FAIRS. Leave the Motorway at Junction 27. Follow the main road for a very short distance, you will see a B.P. Petrol Station on the Right hand Side…Turn right directly before the B.P. Station…Follow this road for two to three miles until you see the ” Corner House” Restaurant on the right hand side. Turn right there so the Restaurant is on your left hand side. Follow the road for circa three miles until you see a “T” Junction..Turn right towards Chorley and after circa 800 Meters turn left at the “T” Junction….You will recognize where you are ! The Hotel is on the right hand side, there will be a large sign at the entrance……. At present there are no restrictions in place but if in future there are, follow the following instructions. Leave the motorway at Junction 28, keep in the right hand lane and turn right at the Traffic Lights. Turn Right again at the next set of Traffic Lights. Now keep straight on, it is a straight road for probably 20 minutes until you see a sign on the Right hand Side for “Bygone Times”. Turn right here and follow the road to a mini roundabout and turn right….follow the road following the Arms Fair Signs, the Hotel is the third entrance on the right If you have a Sat Nav it will take you straight to the Hotel. The event held at the Park Hall Hotel, Charnock Richard attracts some of the UK’s best known Militaria dealers so collectors can buy, sell or exchange a wide range of military collectables from many eras of history with confidence. Quality advertising attracts collectors and veterans alike. Apart from quality reference books, items at the fair include Medals, Badges, Swords, Daggers, Bayonets, Helmets, Flags, Field Equipment, Award Documents, Uniforms, Antique Firearms, Arms and Armour, Legally Deactivated Weapons, Military Postcards, Vehicles and much much more. 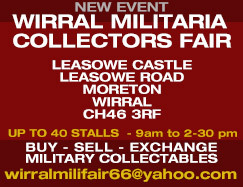 We hope to see you at the next Preston Arms Fair for a very enjoyable day!